7am to 11pm departing from Venice city centre. Shared airport water taxis operate every day throughout the year. We are comparing Venice Marco Polo Airport Transfer With Shared water Taxi Prices from leading ticket suppliers and Try to find you Cheap tickets prices on the market. Begin your Venetian experience from the moment that you step out of the airport by taking a comfortable speedboat across the Venice Lagoon. On the way you'll pass a handful of Venice's islands, including Murano, where spectacular glass works have been handmade for centuries. You'll get to see the city from the water and get a little orientated before setting off into its maze of streets. This shared transfer is a happy compromise between public transport and private transfer. 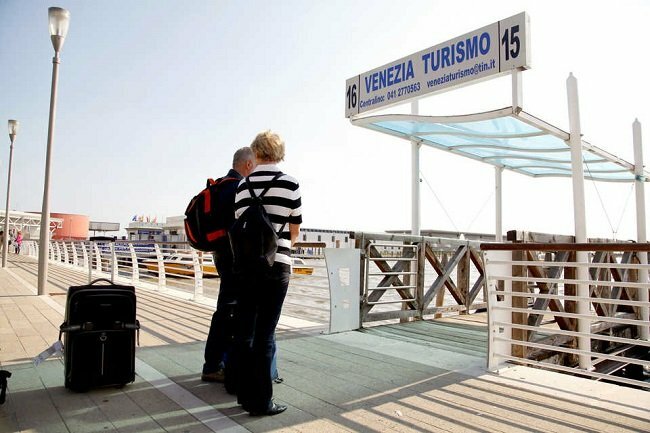 Your boat will be shared with only a small group of people making the journey quicker than it is with the standard public Vaporetto. Not just more convenient than public transport, for couples or individuals, it's also more economical than a private transfer. This transfer takes a route from Marco Polo Airport to Piazzale Roma (Venice's bus/train station), through the Grand Canal to San Marco Square and across the Lagoon to Lido Island, passing close to all of Venice's neighbourhoods. The transfer is also available in reverse to return to Marco Polo Airport. Ideal for solo travellers or couples because the shared taxi will be a better price. If you have a large suitcase or are travelling with children then the transfer will be much more convenient for you. Your Experience With Venice Marco Polo Airport Transfer With Shared water Taxi? Arrive at the centre of Venice by boat, just as the very first Venetians did! Don't waste your holiday time waiting for a bus or cramming onto a jam-packed Vaporetto. And, there's no need to splash out on an expensive private taxi. Instead, save both time and money with a shared airport transfer to/from Venice Marco Polo Airport. Enjoy a scenic and economic journey over the Venice Lagoon, through pea green canals to your preferred stop. What Venice Marco Polo Airport Transfer With Shared water Taxi Includes? One way shared boat transfer to/from Venice Marco Polo Airport to Venice City Centre. One piece of luggage per passenger. Marco Polo Airport – Piazzale Rome – Grand Canal (stops depend on passenger's reservations) – San Marco Square – Lido Island. Check where your accommodation is in advance, the driver can help you off at the right stop and give you directions. If you have more than one suitcase you will need to advise the tour supplier. Check that your flight is arriving to/departing from Marco Polo Airport (not Treviso Airport). Travelers Reviews about Venice Marco Polo Airport Transfer With Shared water Taxi? Over 1,000 passengers have rated the shared transfer through TripAdvisor and the average customer score is 4.5 out of 5. On Viator the transfer is also rated a 4.5 out of 5-stars and on Get Your Guide the average score is 4.3 out of 5. Comments mostly agree that the service operates very well and travellers say that it is on time and affordable. Wheelchair accessible. Please advise when booking. Depending on provider you may be charged the full amount if cancellation is made less than 2 days in advance. Shared water transfer should be booked and flight/hotel details confirmed at least 48 hours in advance. This transfer does not stop at JW Marriot, you should disembark at San Marco Square. Luggage transfer to/from boat is not included. Shared water taxi will stop at: Piazzale Roma, Carlton, Sabboini, S.S. Apostoli, Rialto, San Vio, Trinità, San Marco/San Zaccaria, S. Maria Elisabetta and S. Angelo. Departure Point: Marco Polo Airport or any Venice stops (advise when booking watertaxi).